Students, Friends and families of Earlham College, past and present, are being called upon to promote ethical investment by divesting from companies like Motorola, Caterpillar and Hewlett-Packard, which are complicit in Israel's human rights violations. 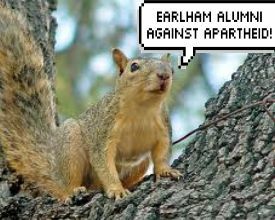 BDS Earlham has launched a new initiative called "Earlham Alumni Against Apartheid" to get everyone associated with Earlham College involved. On behalf of Earlham Alumni Against Apartheid, I’m writing today to ask you to participate in a campaign to pressure Earlham College to live up to our values of peace, justice, and ethical investment. A new student group called BDS Earlham is currently asking our college to divest from three companies that are profiting off of the Israeli military occupation of Palestine. BDS Earlham is asking Earlham Alumni, parents, and friends of the college to show our support for their campaign by signing their petition. I’d like to invite you to take just one moment to show your support by signing their petition and becoming involved in this important campaign. Motorola manufactures the Israeli military with encrypted mobile phone technology and manufactures “virtual fences” and surveillance systems for Israeli settlements. These Jewish-only settlements are a potent symbol of Israeli apartheid and are illegal under several international laws, including the 4th Geneva Convention. Motorola also has close ties with Aeronautics Defense Systems (ADS), which makes drone aircraft. Last April Human Rights Watch reported finding debris from Motorola bomb components in the rubble of civilian buildings in the Gaza Strip. Caterpillar manufactures weaponized bulldozers that the Israeli army uses to demolish Palestinian homes. Since Israel occupied the West Bank and the Gaza Strip in 1967, it has demolished more than 12,000 Palestinian homes, leaving over 70,000 people traumatized and without shelter. Hewlett-Packard manufactures the Basel System, a body scanning technology used at Israeli checkpoints at the Gaza borders and inside the West Bank. Israel’s system of checkpoints prevent Palestinians from moving freely, stopping farmers from accessing their land, students from going to school, and sick people from getting medical attention.